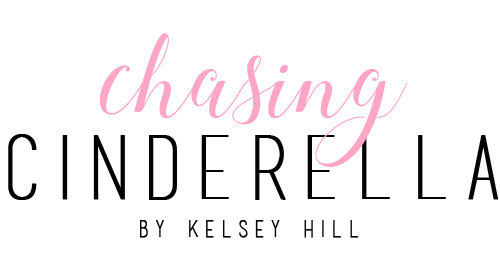 I snagged this long sleeve striped tee during the #nsale and I'm so glad that I did! It is super soft, and longer in the back so it can be worn with leggings! It will also be perfect for layering come cooler temps! 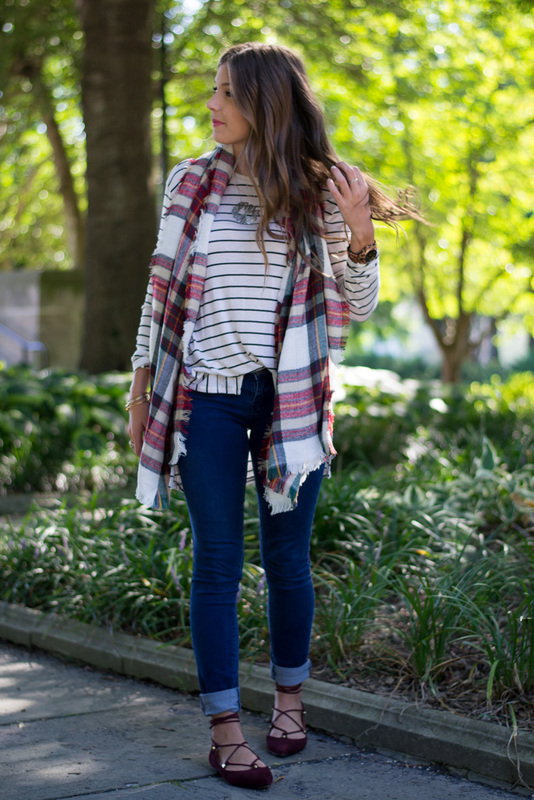 Blanket scarves are a must for fall, and can be styled so many different ways! Such a cute look girl! 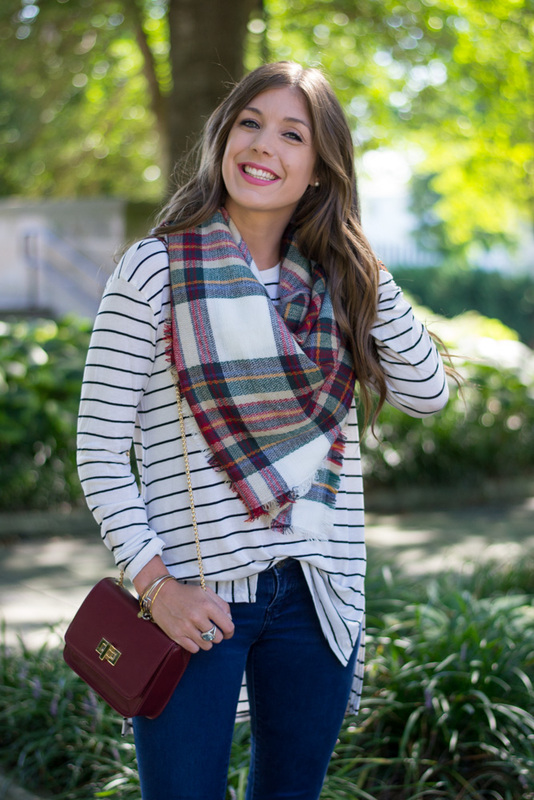 I love mixing plaid with stripes! Omg I bought this top too! Lol. I love the plaid stripe combo! It is so cute babe! Kelsey, this outfit is literally THE CUTEST!!!! I am shopping it now because I must have it all! LOVE! 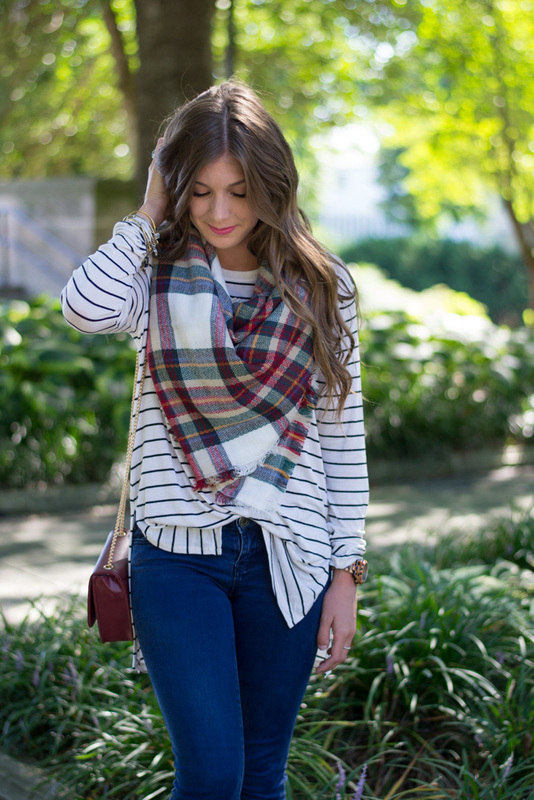 The stripes + plaid together are perfection! And I love the burgundy cross body paired with the flats! So perfect! Such a gorgeous fall look! Loving that scarf and those shoes!! I just adore this scarf! So gorgeous! 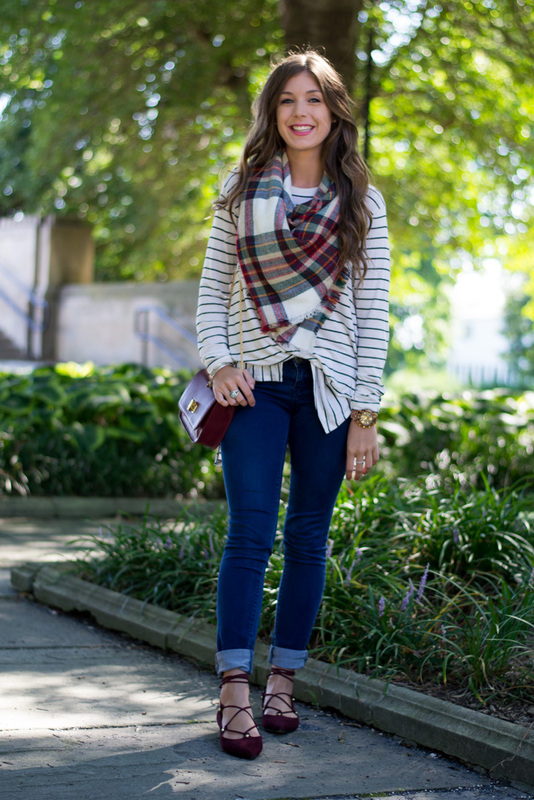 Love the stripes and plaid together, perfectly styled!! Cute! I love the scarf! 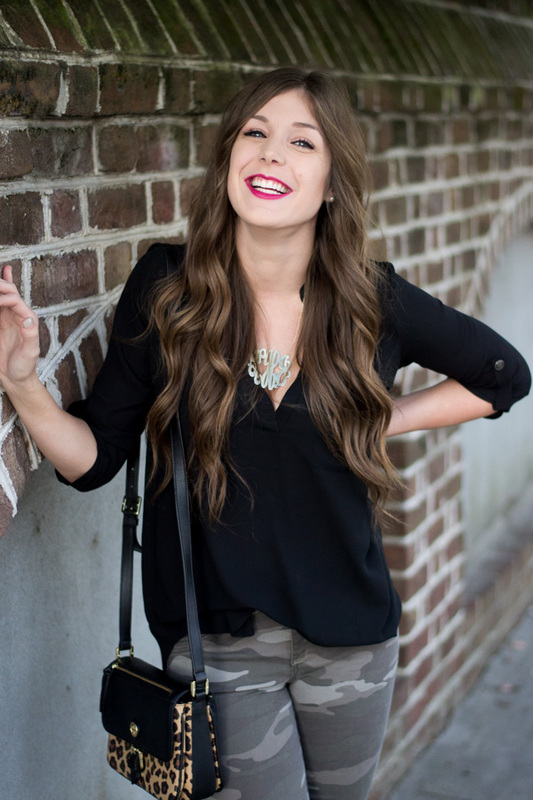 this type of combination is one of my favorites for fall! I got a similar shirt in last year's nsale and I probably wore it like this more than any other way. Love the colors of that scarf! Kelsey this looks like an outfit straight from Pinterest- it's goals! I love it. I feel like I'm always so bad at mixing any prints and you make it seem so effortless. I am loving this post! I love wearing stripes with plaid, but know it needs to be done right. And, girl, you are doin' it right! Also, I am obsessed with your shoes. The whole outfit, really! I LOVE THIS OUTFIT!! Not only do I love the pattern mixing going on here, but I love your maroon flats and bag! Such a gorgeous mix of color, patterns and texture! Go girl!! I love this look on you!! 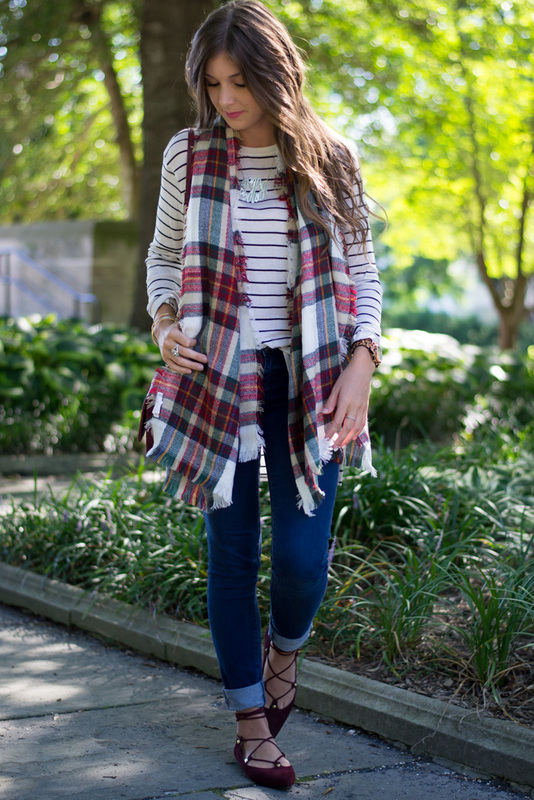 I have never been bold enough to try the pattern mixing but, I love the way that you did it with the scarf so, I might have to try it out this Fall!